Japan has the procurement responsibility for 9 of ITER's 19 superconducting toroidal field winding packs and all 19 of the toroidal field coil cases. In a major production milestone the first winding pack has been completed, after the realization of the winding, heat treatment, radial plate insertion, and impregnation phases. Creating the winding pack of an ITER toroidal field coil is a multistep process that demands precision and rigour. The first Japanese toroidal field winding pack was realized by Mitsubishi Heavy Industries Ltd/Mitsubishi Electric Co; a second is underway at Keihin Product Operations/Toshiba Corp.
At QST—the National Institutes for Quantum and Radiological Science and Technology which oversee the procurement of all the ITER components allocated to Japan—teams have been hard at work on the fabrication of the toroidal field coils. ITER's powerful D-shaped coils consist of a winding pack enclosed in a thick stainless steel case. The multistep fabrication process of the inner core starts with the winding of seven double pancake modules according to rigorous manufacturing specifications. Conductor unit lengths, for example, must be kept within ± 0.01 percent as they are wound. Next, helium inlets and joints are created and each double pancake module undergoes heat treatment—a process where temperatures of 650 °C for 100 hours (± 5 °C) renders the conductor alloy superconducting. After heat treatment, radial plates are transferred carefully between conductor layers without causing strain greater than 0.1 percent, to avoid degrading conductor performance. The conductors are then extracted from the radial plate grooves and wrapped in insulating tape before being gently reinserted. At this stage of the process, the double pancake modules are sealed with cover plates by welding and then insulated and impregnated (or "hardened") with resin, a manufacturing step that only tolerates an additional ±1 mm of distortion in planarity over the entire double pancake. Finally, the seven double pancakes were stacked together to form a winding pack, which was then covered with insulating tape for its ground insulation. ITER management is using a number of ITER Council-approved milestones to track progress of the ITER Organization and Domestic Agencies against the overall schedule. For Japan, the ground insulation of the winding pack for toroidal field coil #1 is one of these major milestones, which the Japanese teams are proud to have completed ahead of deadline. 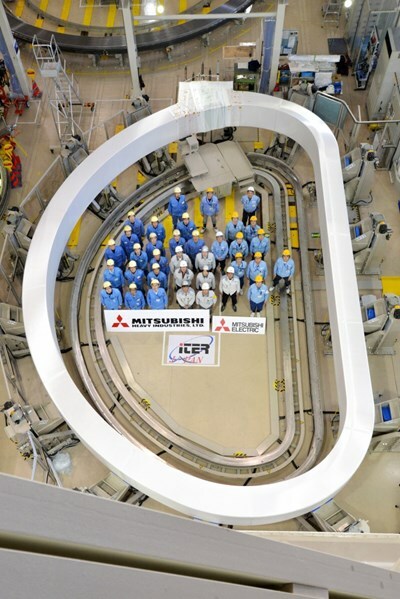 The milestone was achieved at the Futami plant of Mitsubishi Heavy Industries Ltd/Mitsubishi Electric Co. Work is also underway, in an identical manufacturing process, at the second Japanese manufacturing line for toroidal field coils—Keihin Product Operations of Toshiba Corp.